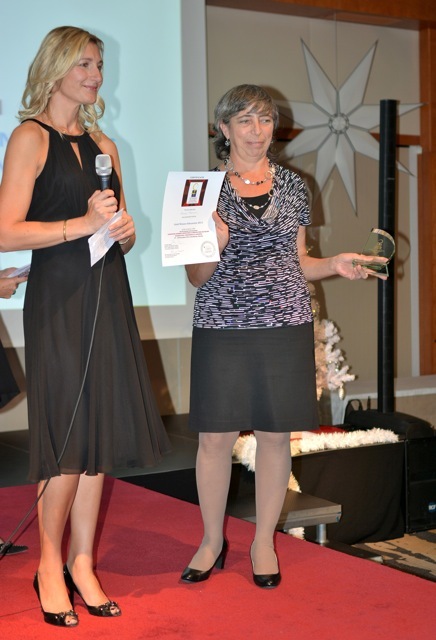 Anna Moreno, Engisis partner, won the 2013 EUWIIN International Award prize, in the EDUCATION & RESEARCH CATEGORY. The prize is organized by European Woman Inventors and Innovators Network (EUWIIN), and it is awarded to European woman who have excellent innovation capabilities. Anna arrived at the finals among 80 other women, coming from all around Europe. Thanks to her talent and efforts, Anna won the finals and she got the Gold Winner Prize. In 1979, Anna Moreno graduated with honours in chemical engineering in Naples. Winner of a fellowship for a master’s degree in macromolecular science, successfully completed in August 1981 at the Case Western Reserve University in Cleveland Ohio. In 1983, she joined ENEA where she worked on the design of radioactive waste treatment plants for which she deposited two patents. After this experience she began to work in technology transfer as responsible of several research contracts and services in favour of SMEs. Starting in 1999, she launched the ENEA e-LEARN platform to spread the knowledge developed by researchers in the context of European and national projects. In January 2010, she became head of training and information service at ENEA. The implementation of the platform was obtained thanks to many projects which she has personally designed and managed. She has received many official recognitions: in 2007 the ENEA e-LEARN platform was recognised among the 10 best practices at international level. In 2008, she received the award for the best cooperation project in sustainable energy during the sustainable week organized by the Commission in Brussels. In 2009, she received an award for DEPUIS project for the best innovation tool. In 2011, her curriculum was chosen among the best 1000 curricula for the “pink quota” of the November 23, 2012 Italian Law n. 215 on the gender balance among councils of local authorities, regional councils and committees of competition between public administrations. In 2012, she won the Italian ITWIIN competition for higher education. Individual citizens / workers can increase their knowledge to work in an environment of greater satisfaction. This open window to the outside world has become an instrument of “attraction” to develop other content. Today the platform has more than 400 learning objects which have been used by more than 70.000 customers. The dissemination of knowledge is not, however, stopped within national borders. In fact, in 2008 the project DESIRE, promoted together with UNESCO, has won an award as best international cooperation project. Video lessons relating to sustainable development were managed in real time in the conference centers.